Wooden Pallet Pallet - practicallya universal blank for many pieces of furniture. 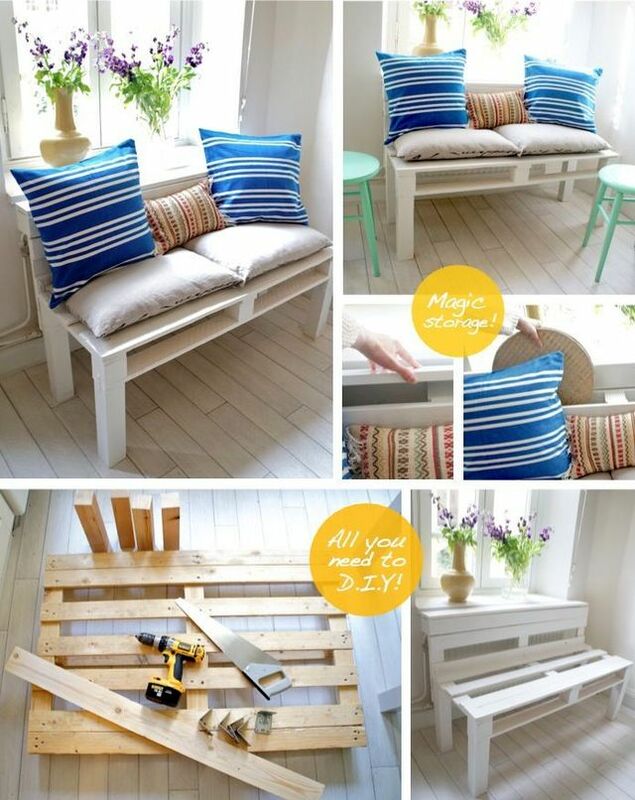 To a cute coffee table is perfect for a bench of pallets with your own hands. 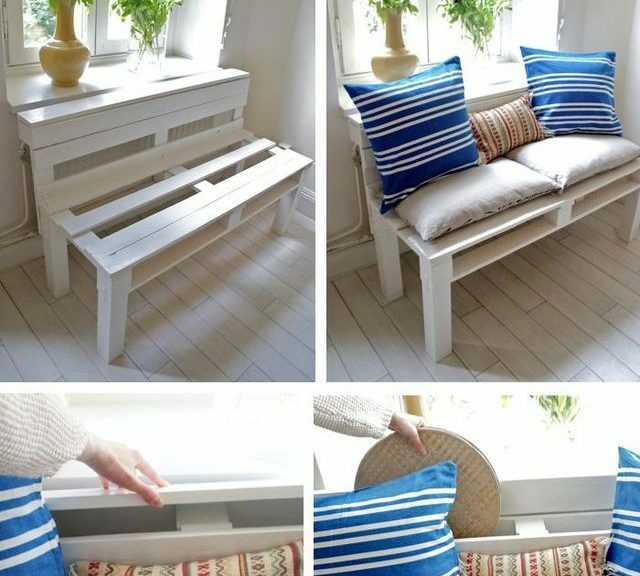 Thanks to the structure of the pallet, in the back and seat of the bench, you can make additional storage space for things. optional - primer, water repellent impregnation, paint. 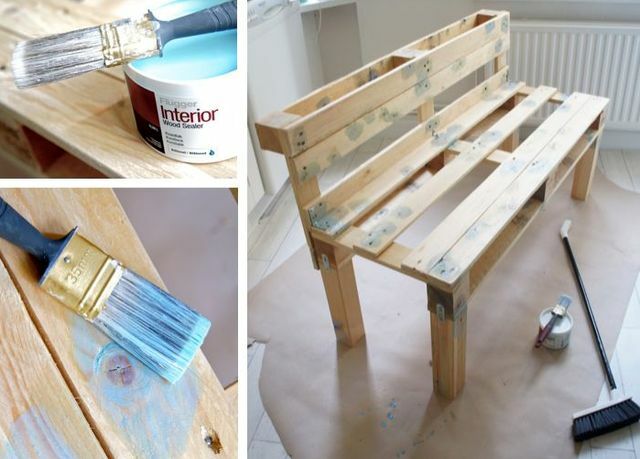 Cut the pallet into two pieces. 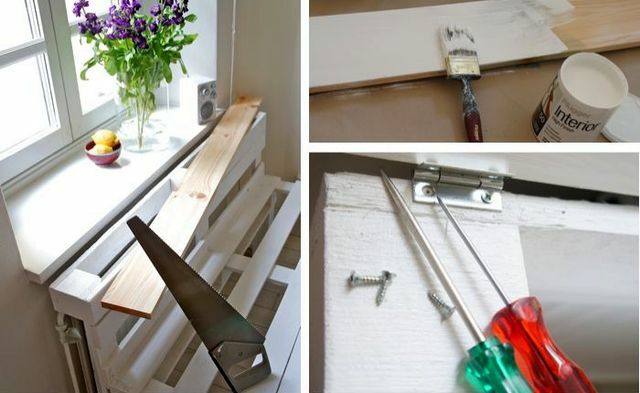 Turn the half of the pallet over and place the wooden bars in the corners. 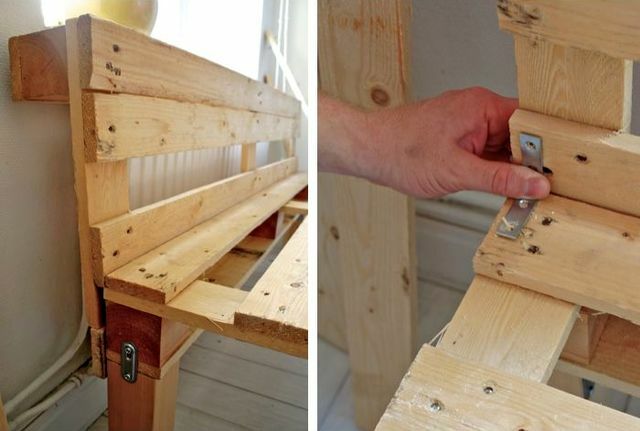 Attach the bars with metal corners. For strength and stability of the legs, also use flat metal strips for fastening from the outside. Now put the backrest on. 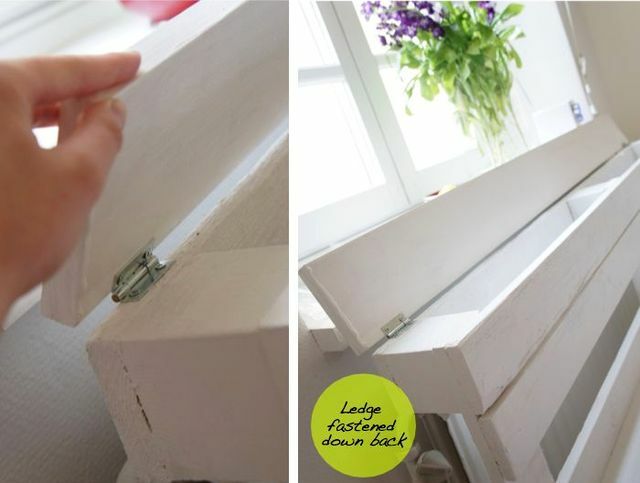 Use also metal bars and corners for fixing. Make sure that the backrest and legs are not loose. Examine the surface of the resulting bench. All holes and cracks can be covered with plaster or putty. Sand the surface if there is anything. If the bench will stand in the open air in the garden or in the yard, it is better to cover it with water-repellent impregnation. Before painting, treat the surface with a primer for wood. 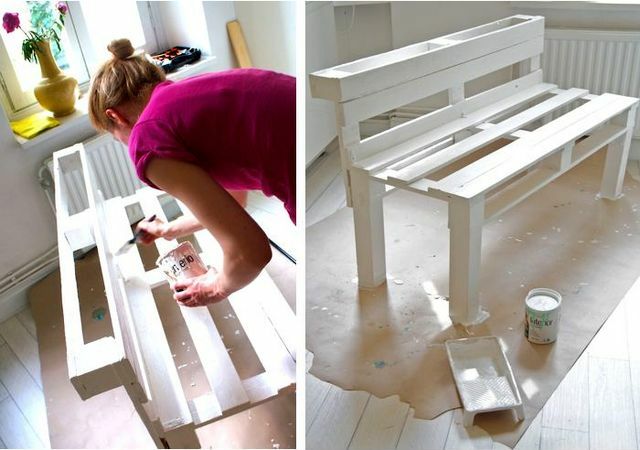 Paint the surface of the bench with paint. A wooden board that will become a door, alsocolor and attach it to the top of the back with metal loops. In the formed closing box you can fold the cushions, plaid and other things. 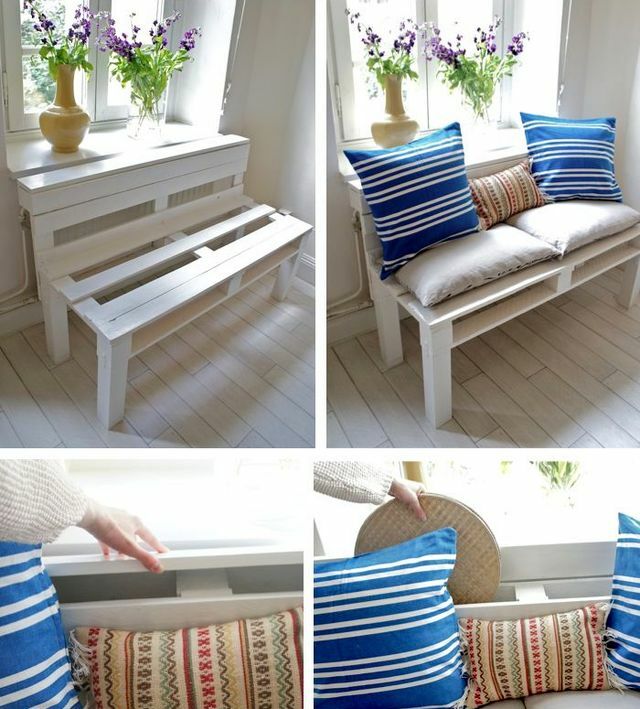 To make a bench of pallets turn into a cozy sofa, put on the seat and back large soft cushions. Done!